3Neuroscience Centre, Queen Elizabeth Hospital, Birmingham B15 2TH. Aims: The lung is one of the major sites of phase I cytochrome P450 enzyme and phase II sulfotransferase expression, which together are thought to act as an enzymic barrier against the unimpeded transfer of airborne xenobiotics into the lung parenchyma and systemic circulation. Sulfate for conjugation is produced primarily from the oxidation of cysteine, begun by cysteine dioxygenase (CDO), and completed with the conversion of sulfite to sulfate via sulfite oxidase (SO). Little is known about the site of expression of these two enzymes in the alveoli of the human lung. Methods: Antibodies and oligonucleotide probes raised against both CDO and SO were used for immunohistochemistry and in situ hybridisation, respectively, to investigate the expression of CDO and SO in human lung alveoli. Results: CDO and SO were expressed in alveolar epithelial cells, which is also the site of expression of cytochrome P450 1B1. Conclusions: These results demonstrate that the two key enzymes in sulfate production are expressed in the same locale as phase I and phase II enzymes, and that these two enzymes may be involved in the production of sulfate for the maintenance of a metabolic barrier against the entry of airborne xenobiotics and the synthesis of important structural proteins and proteoglycans. The lung is a major point of entry for many xenobiotics present in the environment, and eliminating them before they enter the blood system via the lungs is essential to the health of the human body. Gas exchange occurs in the alveoli, and as such the alveoli are the first point of contact for airborne xenobiotics. They are also a major site of phase I cytochrome P450 enzyme expression1 and Phase II sulfotransferase expression,2 which together are thought to act as an enzymic barrier against the ingestion of airborne xenobiotics into the systemic circulation. Phase II sulfation reactions rely upon a readily available supply of sulfate. However, sulfate ions are relatively poorly absorbed in the gut.3 Consequently, the source of sulfate for the numerous sulfation reactions that occur in vivo, including phase II xenobiotic elimination, is the oxidation of cysteine. The first and rate limiting step in this pathway is that of conversion of cysteine to cysteine sulfinic acid by cysteine dioxygenase (CDO).4 This reaction occurs in a single step, which uses molecular oxygen.5 The pathway is continued by the conversion of sulfite to sulfate by the molybdenum containing enzyme, sulfite oxidase (SO), before the formation of the cofactor of sulfation reactions, phosphoadenosine-5′-phosphosulfate (PAPS) (fig 1). It has been shown that CDO mRNA is present in the bronchiolar epithelia of the rat6; however, little is known about the expression of these two enzymes in the alveoli of the lung. Here we report the results of immunohistochemistry and in situ hybridisation studies investigating the expression of CDO and SO in the alveoli of the human lung, and immunohistochemical studies on the expression of the phase I metabolising enzyme, cytochrome P450 1B1 (CYP 1B1). 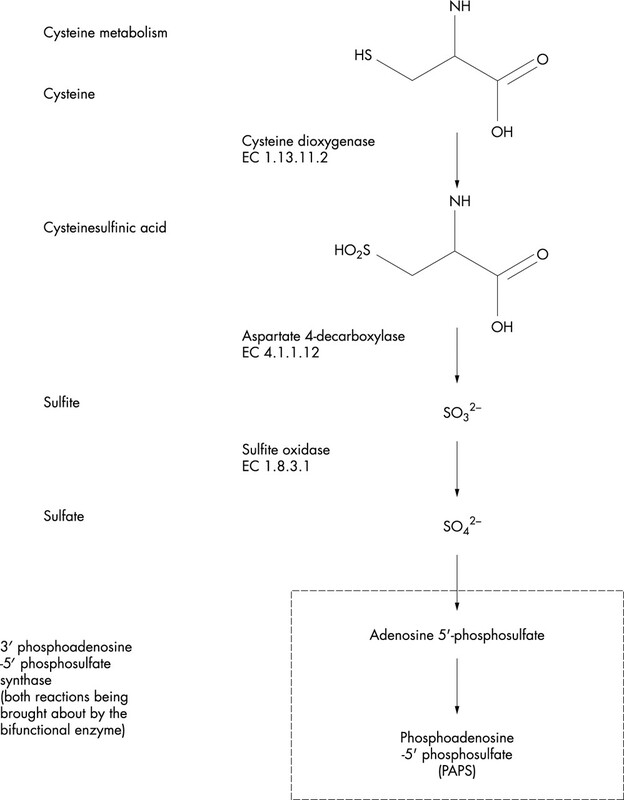 Pathways of cysteine metabolism forming the cofactor, PAPS, for sulfation reactions. Sections of human lung (12 μm) were cut and mounted on to electrostatically charged microscope slides (BDH, Poole, Dorset, UK). Several sections (n > 5 for each subject) were used for each experiment. CDO and SO were detected using diaminobenzidine (DAB) immunohistochemistry, as described previously,7,9 using the following conditions: anti-CDO (1/25 dilution for both anti-H and anti-R) or anti-SO (1/50 dilution) overnight at 4°C; donkey antisheep IgG (1/12.5 dilution; The Binding Site), one hour at room temperature; goat peroxidase–antiperoxidase (PAP; 1/25 dilution), one hour at room temperature. As additional negative controls, antibody diluent alone and non-immune sheep serum (1/25 dilution) were used on further slides instead of anti-CDO antibody. In addition, anti-SO (1/50 dilution) was incubated with an excess of antigenic peptide for one hour under continuous rotation, centrifuged to remove any precipitate that may have formed, and used instead of anti-SO antibody as a preabsorbed antibody control. As a positive control and to assist in the identification of the alveolar epithelium, anti-CYP 1B1 was also used, because it is known to be expressed in the bronchiolar and alveolar epithelia of the lung.10,11 CYP 1B1 was detected using DAB immunohistochemistry, as described previously,8 using the following conditions: anti-1B1 (1/50 dilution), overnight at 4°C; goat antirabbit 1B1 (1/25 dilution; The Binding Site), one hour at room temperature; rabbit PAP (1/50 dilution, Zymed, Cambridge BioScience, Cambridge, UK), one hour at room temperature. Additional negative controls of no primary antibody and non-immune rabbit serum (1/50 dilution; The Binding Site) were performed as described above. CDO was detected using non-radioactive nitroblue tetrazolium/5-bromo-4-chloro-3-indolyl phosphate in situ hybridisation, as described previously,9 using 5′ digoxigenin labelled probes under the following conditions: positive or negative probe (10 ng/μl; Alta Bioscience, University of Birmingham, UK), overnight at 37°C; antidigoxigenin alkaline phosphatase conjugate (1/100 dilution; Boehringer Mannheim GmbH, Lewes, Sussex, UK), one hour at room temperature. Additional slides were incubated with water replacing the probe in the hybridisation solution or hybridisation solution alone. Controls were used as above. The results of immunohistochemistry and in situ hybridisation experiments were identical in both subjects studied. Both anti-H and anti-R CDO antibodies gave identical results. Results shown are typical of the staining observed. CDO was expressed in the alveolar epithelial cells as demonstrated by both immunohistochemistry (fig 2A) and in situ hybridisation (fig 2B). These cells were characterised by the presence of cilia on their apical surface. Expression was not seen in the smooth muscle cells lining the alveoli or in blood vessels within the surrounding tissue. Both the omission of primary antibody (fig 2C) and the use of non-immune sheep serum (fig 2D) as immunohistochemistry controls resulted in no staining. A similar negative result was obtained with the use of a sense oligonucleotide probe in the in situ study (fig 2H). Expression of cysteine dioxygenase and sulfite oxidase in the human lung typical of the expression observed in all sections investigated. Immunohistochemistry (positive staining is brown, haematoxylin nuclear counterstain is blue) and in situ hybridisation (positive staining is blue) were performed as outlined in the Methods section. (A–D) Expression of cysteine dioxygenase (CDO). Both CDO protein and mRNA were expressed in the bronchiole epithelium. (A) CDO protein; (B) CDO mRNA; (C) omission of anti-CDO antibody in immunohistochemistry; (D) replacement of anti-CDO antibody with non-immune sheep serum. (E–H) Expression of sulfite oxidase (SO). Both SO protein and mRNA were expressed in the bronchiolar epithelium. (E) SO protein; (F) SO mRNA; (G) replacement of anti-SO antibody with anti-SO antibody preabsorbed with antigenic peptide, as described in the Methods section; (H) replacement of antisense oligoprobe with sense oligoprobe. (I) Expression of cytochrome P450 1B1 protein. Cytochrome P450 1B1 was localised in the bronchiolar epithelium and was used to confirm the localisation of CDO and SO. SO was expressed in the alveolar epithelial cells, again as demonstrated by both immunohistochemistry (fig 2E) and in situ hybridisation (fig 2F). No expression was seen in the smooth muscle cells lining the alveoli or in blood vessels within the surrounding tissue. The appropriate control experiments resulted in no staining: omission of primary antibody (data not shown), the use of non-immune sheep serum (data not shown), preabsorption of SO antibody with antigenic peptide (fig 2G), and the use of sense oligonucleotide probe (fig 2H). The demonstration of CDO and SO protein and mRNA in human alveolar epithelial cells suggests that these enzymes are responsible for the production of sulfate in situ, which can then be converted to the substrate for phase II sulfotransferases or be used for the sulfation of structural components of the alveolus. Sulfate is present within the alveolus,13 as demonstrated by the expression of heparan sulfate and dermatan sulfate proteoglycans within the human alveoli,14,15 but there has been no direct measurement of sulfate production to date. The presence of the metabolic machinery for sulfate production in the epithelial cells of the alveolus, as shown in our study, does not prove conclusively that sulfate production actually occurs here. It is possible that PAPS, the sulfate carrier for sulfation reactions, may be transported to the lung after synthesis elsewhere in the body, but no evidence for this has yet been provided. However, the presence of sulfated proteins within the alveolus suggests that sulfate is indeed produced in the alveolus. It is not possible to exclude the possibility that longterm exposure to environmental pollutants over the period of a lifetime could be affecting the expression of CDO and SO observed in these two subjects. To date, there have been no studies that have investigated the effect of environmental pollutants upon the expression of CDO and SO, which makes it impossible to gauge the effects that they may be having upon our results. In addition, because the two subjects had not been exposed to pollutants or toxicants other than what would be expected for the general population, obtaining a baseline expression for comparison purposes would prove very difficult. However, because the exposure of these patients to environmental pollutants was only what would be expected in the general population, the effects of these pollutants can be disregarded for the purposes of our study. Therefore, in light of these considerations, it is reasonable to conclude that sulfate is probably produced in situ within the alveolar epithelial cells; our study is the first to produce direct evidence for this. Owing to the requirement of sulfate within the alveolus for detoxification reactions (as demonstrated by the expression of phase I enzymes such as P450 1A116 and 1B1) and for the sulfation of proteins, such as structural and mucous proteins, it would be useful to consider the importance that in situ sulfate production may have. The alveolar surface is designed to facilitate the transfer of compounds across its surface in both directions. It is the first point of contact for airborne xenobiotics. Xenobiotics that enter the systemic circulation via the lungs have access to other tissues before they are available to be metabolised by hepatic phase I and II enzymes. Orally ingested xenobiotics, in contrast, undergo the hepatic first pass effect. Therefore, it is possible that, without the potential for sulfate production within the alveolus, many carcinogens or potential carcinogens would enter into the systemic circulation unimpeded, without detoxification, with the potential to cause disease. Evidence for this is provided by the report that the long arm of chromosome 5, where the CDO gene is located,17 is deleted in lung cancer,18 suggesting that the abnormal or absent pulmonary expression of CDO might have aetiological implications. In contrast, the chromosomal region 12q12, where the SO gene is located, is not linked to human neoplasia. In addition to the maintenance of a metabolic barrier against the entry of xenobiotics, sulfate is an important component of many structural proteins and proteoglycans within the alveolus. As described above, the basal lamina of alveolar cells consists of proteoglycans such as heparan sulfate and dermatan sulfate. In addition, the surface of the bronchioles and alveoli is coated with mucous, produced by goblet cells and submucosal glands, which consists of 1–2% sulfate.19 This in turn is coated with surfactant and periciliary fluid, secreted by Clara cells,20–22 the proteins of which are sulfated.23 These structural components are synthesised in situ, and it is therefore important that sulfate is produced in the alveolus for these metabolic syntheses to occur. It has also been reported that tobacco smoke can alter the expression of sulfated mucous in rat tracheal submucosal glands,24 which may be a protective response. Therefore, the expression of the key enzymes for sulfate production in the alveolar epithelial cells is consistent with this need for sulfate production. In conclusion, the data presented here provide further evidence of the presence of a potent enzymic barrier at the lung surface–air interface that is capable of inactivating airborne xenobiotica, and that sulfate may be produced in situ within the alveolar epithelial cells for the maintenance of such a metabolic barrier, in addition to providing sulfate for the metabolic synthesis of structural proteins and proteoglycans. Stanley LA, Carmichael J, Wolf CR. Cytochrome P-450 induction in human lung tumour-derived cell lines. Characterisation and effects of inflammatory mediators. Eur J Biochem1992;208:521–9. Hume R, Barker EV, Coughtrie MW. Differential expression and immunohistochemical localisation of the phenol and hydroxysteroid sulphotransferase enzyme families in the developing lung. Histochem Cell Biol1996;105:147–52. Florin T, Neale G, Gibson GR, et al. Metabolism of dietary sulphate: absorption and excretion in humans. Gut1991;32:766–73. Sorbo B, Ewetz L. The enzymatic oxidation of cysteine to cysteinesulphinic acid in rat liver. Biochem Biophys Res Commun1965;3:359–63. Lombardini JB, Singer TP, Boyer PD. Cysteine oxygenase II: studies on the mechanism of the reaction with 18oxygen. J Biol Chem1969;244:1172–5. Shimada M, Koide T, Kuroda E, et al. Expression and localisation of cysteine dioxygenase mRNA in the liver, lung and kidney of the rat. Amino Acids1998;15:143–50. Rieder CR, Parsons RB, Fitch NJ, et al. Human brain cytochrome P450 1B1: immunohistochemical localization in human temporal lobe and induction by dimethylbenz(a)anthracene in astrocytoma cell line (MOG-G-CCM). Neurosci Lett2000;278:177–80. Parsons RB, Sampson D, Huggins CC, et al. Renal localisation of rat cysteine dioxygenase. Nephron2001;88:340–6. Mollerup S, Ovrebo S, Haugen A. Lung carcinogenesis: resveratrol modulates the expression of genes involved in the metabolism of PAH in human bronchial epithelial cells. Int J Cancer2001;92:18–25. Hukkanen J, Lassila A, Paivarinta K, et al. Induction and regulation of xenobiotic-metabolizing cytochrome P450s in the human A549 lung adenocarcinoma cell line. Am J Respir Cell Mol Biol2000;22:360–6. Lehr HA, van der Loos CM, Teeling P, et al. 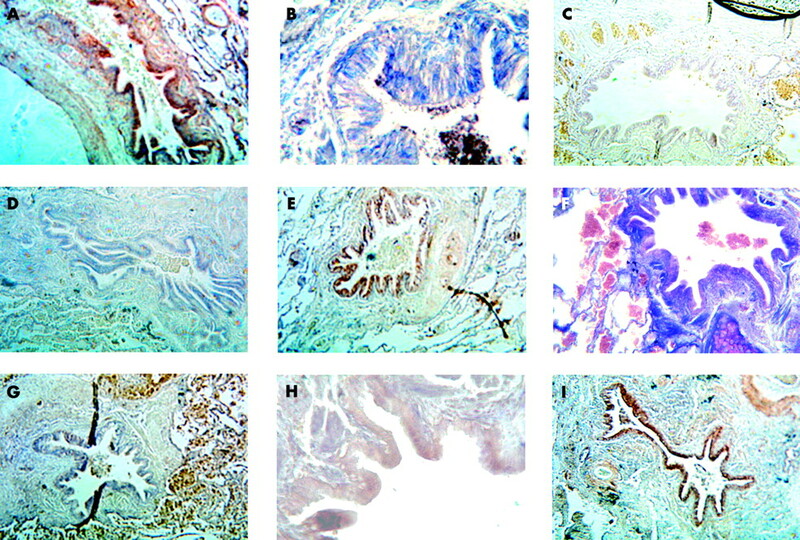 Complete chromogenic separation and analysis in double immunohistochemical stains using Photoshop-based image analysis. J Histochem Cytochem1999;47:119–25. Li ZY, Hirayoshi K, Suzuki Y. Expression of N-deacetylase/sulfotransferase and 3-O-sulfotransferase in rat alveolar type II cells. Am J Physiol Lung Cell Mol Physiol2000;279:L292–301. Van Kuppevelt TH, Cremers FP, Domen JG, et al. Ultrastructural localization and characterization of proteoglycans in human lung alveoli. Eur J Cell Biol1985;36:74–80. Van Kuppevelt TH, Domen JG, Cremers FP, et al. Staining of proteoglycans in mouse lung alveoli. I. Ultrastructural localization of anionic sites. Histochem J1984;16:657–69. McLemore TL, Adelberg S, Liu MC, et al. Expression of CYP1A1 gene in patients with lung cancer: evidence for cigarette smoking-induced gene expression in normal lung tissue and for altered gene regulation in primary pulmonary carcinomas. J Natl Cancer Inst1990;82:1333–9. Jeremiah S, McCann KP, Williams AC, et al. Chromosomal localisation of genes encoding for human and mouse liver cytosolic cysteine dioxygenase. Ann Hum Genet1996;60:29–33. Ueno K, Kumagai T, Kijima T, et al. Cloning and tissue expression of cDNAs from chromosome 5q21–22 which is frequently deleted in advanced lung cancer. Hum Genet1998;102:63–8. Rubin BK. Physiology of airway mucus clearance. Respir Care2002;47:761–8. Margraf LR, Paciga JE, Balis JU. Surfactant-associated glycoproteins accumulate in alveolar cells and secretions during reparative stage of hyaline membrane disease. Hum Pathol1990;21:392–6. Auten RL, Watkins RH, Shapiro DL, et al. Surfactant apoprotein A (SP-A) is synthesized in airway cells. Am J Respir Cell Mol Biol1990;3:491–6. Jeffery PK. The origins of secretions in the lower respiratory tract. Eur J Respir Dis Suppl1987;153:34–42. Weaver TE, Kropp KL, Whitsett JA. In vitro sulfation of pulmonary surfactant-associated protein-35. Biochim Biophys Acta1987;914:205–11. Lewis DJ, Jakins PR. Effects of tobacco smoke exposure on rat tracheal submucosal glands: an ultrastructure study. Thorax1981;36:622–4.